CORE VALUES AWARDS: ON YOUR MARKS … GET SET … APPLY! Research Project of the Year. Applications are being taken now through May 10, so visit the Core Values Awards webpage and download the Applicant’s Kit. The winners will be recognized at the Core Values Awards Gala, to be held in conjunction with the 2017 IAP2 North American Conference, Sept. 6-8, in Denver, Colorado.. Need inspiration? Check out past winners by going to the Core Values Award webpage and scrolling to the bottom – learn from 2014, 2015, 2016 winners and more! Celebrating Excellence – Apply for the 2016 Core Values Awards! Yes, it is that time of year again. It is time to APPLY for the IAP2 USA Core Value Awards: Celebrating the Best in Public Participation. IAP2 USA’s premier Core Values Awards recognize and encourage projects and organizations that are at the forefront of public participation. The Awards were created to promote excellence, quality and innovation in public participation. Embedding the IAP2 Core Values in organizations and projects that demonstrate leading practice is a key focus for the Awards. We are always amazed at the caliber of the work that is done both here in the U.S. and around the world. Learn more about the 2015 U.S. winners and check out the international 2015 Showcase. THIS COULD BE YOU IN 2016! Winners will be announced at the Core Values Awards Gala at the North American Conference in Montreal, Canada, September 29, 2016. So not only do we have some new award categories but, we are also shaking up the process of applying. We have heard from several of you that BEFORE you put in the time and energy to fill in the application you would like to know if your project would be eligible. So if you are wondering about this we encourage you to send us a short LETTER OF INTENT. However, you are also welcome to skip this process and go directly to the Applicant’s Kit. By May 11 you will be notified if you have been invited to submit a full application for consideration. The Full Application will be due by Friday, June 10th. Information on the final application is contained in the Applicant’s Kit. What is required in the Letter of Intent? The primary goal of the Core Values Awards is to recognize excellence in projects that clearly demonstrate and advance all of the IAP2 (USA) Core Values in public participation. For this letter, please select two of the Core Values and describe how your project/team/organization exemplified these values. (200 words max) (Please keep in mind, if invited to submit a full application you will need to address all of the Core Values). * Project and team/organization for project based awards and team/organization for the organizational award. The St. Vrain “team”, receiving their 2015 Core Values Award in Portland. Superintendent Dr. Don Haddad is at far left; Laura McDonald is third from right; Damon Brown is at far right. The City of Victoria and the St. Vrain Valley School District (Colorado) were named Organizations of the Year for Canada and the USA, respectively, at the 2015 IAP2 Core Values Awards last fall in Portland. Both have had to overcome internal trepidation and external cynicism to achieve that status, and the results can be seen in ways ranging from increased involvement in engagement processes to support for public-spending initiatives. St. Vrain Valley Schools also had to let go of “control” over issues in order to improve its public engagement. Laura McDonald, a mother of two girls in the system, got involved when she realized that a $10 – 14 million budget shortfall declared before her children started school had not been addressed by the time they were of school age. She heard all the doom-and-gloom talk about the shortfall, but more ominously, also about the skepticism. According to the District’s Communications Director, Damon Brown, conflict-driven media, polarization and a history of “announce and defend” decision-making led to a wide mistrust of decision-makers; that led to a mill levy override, which would have provided for teachers’ salaries and instructional programs, being voted down in 2005. In 2008, 85 teachers were laid off and the District had no supplementary funding. Shortly after that, a new superintendent came on the scene. Dr. Don Haddad seized on the concepts of P2 – particularly the Core Values – and launched an aggressive campaign of his own to engage with the people. In a relatively short time, he and other district staff members built trust relationships. “Leadership St. Vrain”* was launched, bringing parents and members of the community not directly involved with the school system into the mix, educating them on the “Know-How” (the business of education) and “Know-Who” (the key decision-makers) of the district. In the process, the District, its administrators and teachers – many of whom are seasoned educators with a measure of bias against letting non-experts help make decisions – released ownership of the problems they faced. The result: A $189-million bond measure and a $16.5-million mill levy override both passed in 2008. Another $14.8-million mill levy override passed in 2012. The increased P2 capacity is credited with other results, especially academic achievement. Damon Brown says there has been an upward trend in standardized test scores, increases in the graduation rate and the number of scholarships awarded; and a decline in the dropout rate. Not incidentally, St. Vrain Valley Schools was also named 2015 Organization of the Year by the entire IAP2 Federation. Turning that big ship around, Damon Brown points out, takes more than legislation: It takes a change in thinking and habits. Both St. Vrain Valley Schools and the City of Victoria have not only accomplished that on the inside of their organizations, but the results are palpable on the outside. Katie Hamilton, City of Victoria Director of Citizen Engagement, arrived at City Hall 10 years ago to find there was no policy or template governing public participation and that any “engagement” was an after-thought. Public input did not guide the projects, and citizens were often surprised when a major project was announced. There were customer-service barriers and, despite Victoria’s growing reputation as a high-tech center, the website was out-dated. What’s more, discussions tended to focus on the cost of something, rather than its value. That led to the public becoming skeptical to the point of hostility when decisions were made or projects were announced. But over the past decade, city staff have grown to “embrace the clunky” – that is, step into the difficult discussions, become the facilitator for these conversations and let go of “control” over issues. City departments are also working closer together as a unit, rather than in silos, independent of one another. “Great ideas sessions” are regular occurrences. Some of the tactics include “going to where the people are”. Information and input facilities regarding parks issues were set up in the parks themselves; a pop-up open house was set up on a bicycle trailer, going to fairs, markets, furniture stores, coffee shops, new mothers’ clubs, you name it. In City budget mail-outs at tax time, infographics have replaced pie charts to indicate how one’s money is spent. Can you measure a shift in culture? Here’s one indicator: Attendance at City budget meetings has gone from a group of 30 highly-interested people to over 1,500, with amenities like food provided by local growers creating a lighter atmosphere. CONGRATULATIONS TO THE WINNERS OF THE 2015 IAP2 USA CORE VALUES AWARDS! Metro understood that there was a considerable level of mistrust and skepticism that had to be overcome, and the consultations involved online, face-to-face and single-question mini-surveys, among other things, to reach out to the community. At various times, the consultations were done in Spanish, Russian, Chinese and Vietnamese; even Bhutanese and Tongan, to ensure as much of the community was involved as possible. The result has been broad support for the development project itself, and many of the approaches have been included in Metro’s Public Engagement Guide. This was the second win in as many years for St. Vrain Valley Schools: the district won the 2014 Research Project of the Year for “Leadership St. Vrain”, which was the precursor to this year’s award-winning effort. Project of the Year – Pikangikum First Nation (Reservation) in Northwestern Ontario and Beringia Community Planning, for “Working It Out Together”, which addressed some serious mental-health issues with a community-based approach. Organization of the Year – The City of Victoria, BC, for “Foundations for Success”, an effort to ensure citizens are included in all of the city’s processes. Honorable Mention went to the City of Vancouver, BC, for the “Engaged City Task Force”. P2 for the Greater Good – to the Hawkwood Community Association in Calgary and Forum Stakeholder Relations, for “Our Hawkwood”, a locally-developed neighborhood plan. Indigenous Engagement – to the Pikangikum First Nation. You can learn more about the USA award winners here, and the Canadian award winners here. We encourage you to study the entries and also the criteria for Research Project of the Year, so that you can model your upcoming P2 processes with the 2016 Core Values Awards in mind. You could find yourself on the stage, hearing the applause and receiving the hardware, at next year’s Conference in Montréal! (Portland, OR, Sept. 10, 2015) – Two very public U.S. organizations have been honored for their dedication to include “ordinary” people throughout their processes. 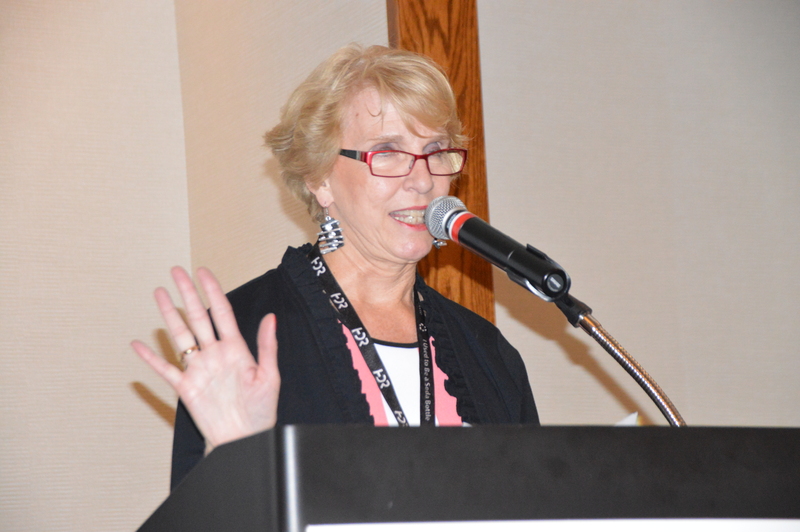 The International Association for Public Participation, USA (IAP2 USA) presented its annual Core Values Awards to Oregon Metro and the St. Vrain Valley School District of Longmont, Colorado at the IAP2 North American Conference in Portland, Oregon. The IAP2 Core Values Awards celebrate work that exemplifies the key principles of Public Participation (P2). These principles (the Core Values) include the belief that people affected by a process have a right to be consulted on the process and to know how their input influenced that process. The “Powell-Division Transportation and Development Project”, a multi-level partnership led by Oregon Metro, was named Project of the Year, for recognizing the importance of engaging the citizens in this highly culturally-diverse area. The transportation project itself aims to solve congestion issues along a major route linking Portland and Gresham, the largest and fourth-largest cities in Oregon, respectively. Oregon Metro faced public skepticism and a sense among the people of being disconnected, and P2 consultants used a variety of methods to overcome that. Work groups focused on specific concerns, there were face-to-face public meetings, online tools, and multilingual single-question surveys at bus stops; languages used included Spanish, Tongan, Bhutanese, Vietnamese and Russian. The St. Vrain Valley Public School District of Longmont, Colorado, was named Organization of the Year for its initiative to have “non-professionals” in the education field – parents and students – join with teachers and administrators to cast the vision and set the course for the school district. Oregon Metro and St. Vrain Valley Schools will now compete against Projects and Organizations of the Year from other IAP2 Affiliates around the world for top honors from the worldwide IAP2 Federation. 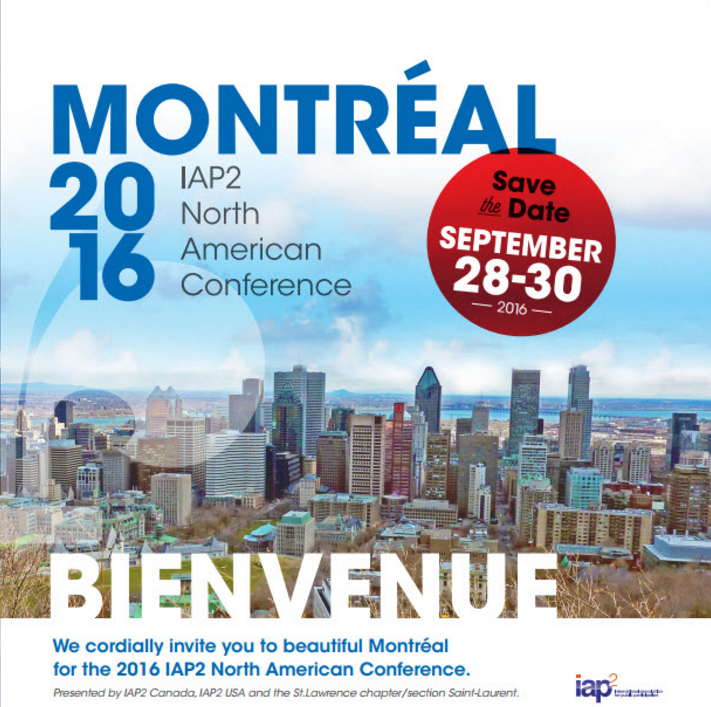 Those awards will be announced at the IAP2 Australasian Conference in Perth, Australia, in October. Video presentations on these winning projects can be seen online. Project of the Year and the Award for Indigenous Engagement – to Beringia Community Planning and the Pigangikum Health Authority for a project to deal with mental health issues on the Pigangikum First Nation in northwestern Ontario. Organization of the Year – to the City of Victoria, British Columbia, for “Foundations for Success”, an initiative to enhance the culture of public participation in civic affairs. Award for P2 for the Greater Good – to “Our Hawkwood” and Forum Stakeholder Relations for a community-developed plan to improve the quality of life in the Hawkwood neighborhood of Calgary, Alberta. Award for Enhancing the Practice (of P2) through Creativity, Contribution and Innovation in the Field – to the City of Calgary, Alberta, for “Action Plan 2015-2018”, a project to increase citizen involvement in civic business. For more information, visit the IAP2 USA Core Values Awards page.